Social media use has grown dramatically in recent years. At this point, it is rare for individuals to not have at least one social media profile. Most people use multiple platforms, including but not limited to Facebook, YouTube, Snapchat, Twitter, and Instagram. While this has led to an ever-connected world, it has also changed how the police investigate crimes and prosecutors prove charges in court. With the amount of information people put online, police or prosecutors often find evidence that supports allegations of criminal conduct. They may even find direct evidence of the crime, such as video of the offense or admissions of guilt. If you have been charged with a crime in or near Orlando, FL, then contact an experienced criminal defense attorney at our office today. One of the first things we will do during a defense investigation is to review your social media content to determine if anything can be used against you in court. While it is possible for prosecutors to access social media content and use it in court, it is not a simple process. There are many steps prosecutors must go through to not only get the content, but then have it admitted into court during a criminal trial. Prosecutors first have to gain access to the social media content, which often requires more than looking it up online and taking a screenshot. Most of the time, prosecutors are going to want to obtain the electronic data from the source – meaning the social media platform itself. This may require obtaining a subpoena for the information, which is not easy. Even if prosecutors are able to gain access to a defendant’s social media account to acquire evidence, the journey is not over. They have to face a defense attorney’s opposition to the admittance of such evidence. All of the standards that apply to typical evidence also apply to social media content. That means during a state-level case, the online content must adhere to Florida’s Evidence Code. 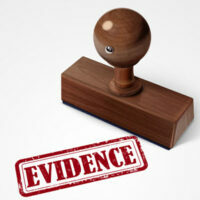 During a federal-level case, the content must adhere to the Federal Rules of Evidence. These rules require that the social media evidence be authenticated. This proves the social media content is real and not fake. It also requires proving that the content is actually of the defendant’s creation and not another person’s writing, photo, or video. If prosecutors cannot authenticate a piece of evidence, no matter what it is, it is not admissible in state or federal court. If you are facing criminal charges and prosecutors want to use social media content against you, call us immediately. We will review the charges against you and the content the prosecutors want to admit into court. We will go over all of the options for defending against this content, including our chances of having it ruled inadmissible and if it is admitted, how we can counter that evidence in court. To learn more about how we can help, contact our Kissimmee criminal defense attorneys at Salazar & Kelly Law Group, P.A. at 407-483-0500. We are prepared to assist you immediately.